Anyway, I didn't close down this blog as I had mentioned last week. All my other blogs are on hold though. I won't be able to visit most of the links posted - sorry about that but I just don't have the time. I am really excited about how successful Mellow Yellow Monday has become though! Thanks everyone! Thanks everyone! MYM is now closed for this week and will re-open Sunday, June 14th at 5:00 pm EST. Check out all the links below for great photos - as well there are some listed in the comment section below. Enjoy! I love a good puzzle! Destination; Monkey! So glad you're not closing this one! I understand pressures though. I am drowning in schoolwork at the moment and tend to do many scheduled posts to fit it all in! Love the photo! I have never seen this game before! Very creative! That looks like a toy that won't stay in the closet. 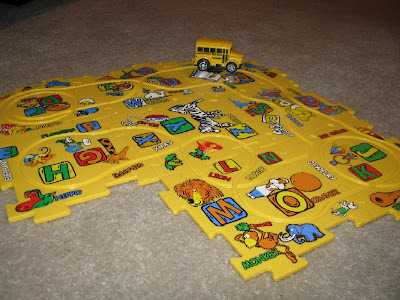 A great yellow and an interesting activity for the little ones! Glad you're not closing down Mellow Yellow ~ I just started photo blogging (thanks to Martha host of Color Carnival!) and I am addicted. Love all the yellow in your Mellow Yellow post. PS - How are you getting Mister Linky to work? I tried again this week and still can't put it on my Color Carnival meme! It's so much more time consuming without it! That's a cool yellow puxzzle.. I'm so glad you haven't closed Mellow Yellow down..as I love the colour yelow and this has been so much fun..
Thankyou for the time you put into it..
That looks a fun toy! Thanks for keeping this meme going! Great MYM photo this week. So colorful. that is one cool educational YELLOW toy! thanks for continuing this meme. Mellow yellow is a bright way to start the week - hope your's is a good one! What happy memories this gives me. My kids had something similar way back in the long ago. They had so much fun with it; I'm sure your little one has every bit as much fun. We had something similar went out son was little. It was fun to design the track and watch the bus go. M O N K E Y !!!!!!! I made something VERY VERY special for you this week and I promise it will make you smile. Thanks for keeping this blog going. It's one of my favorite memes. There is a lot of yellow both back ground and the car. At my blog today it our flag but with flowers. I'm glad you're still doing it but understanding about time constraints. I love the bus track. I'd probably be playing with it too. That looks like a cute thing to play on. Hope Life will be easier on you soon again! Love the post, it's cute. Thanks. that looks like something my little one would love too. Thank you! It's great blog. have a nice week ahead. My grandson would love playing with that. What a fun puzzle and a great yellow photo! My son used to have one something like that. It was fun to play with. Thanks for keeping MYM going. I have been enjoying finding all things yellow. My first entry is up at Mix Pix. I think my son would love to play with that. My 4 year old is looking at the picture of the track with a gleam in his eye. I think he wants one. I also am glad to see that Mellow Yellow has not closed down! what a fun puzzle! I'll have to find one like that for my grandson. You can find my photos here. My son would love to play with that! My MYM entry is up! Now where is the child that wants to play with this? It looks like fun. I hope you don't have to close this down. Maybe one of your regular readers will help you or take over if you can't. awww what cute toy! nice MYM! mine is up as well. i hope im not yet late!
" When I write or share something about one of my friends in a posting, I always make sure I send them a copy of it, so they know what was said about them. Today I included information about you and your blog site in my posting, so I thought I should let you know about it as well." The above paragraph is the first paragraph in an email I sent out today, to all of the owners of blogs whom host "theme days", that I could find email addresses for. But the email I sent to you got returned. The rest of the email is what I posted today on our blog. Go to: www.xanga.com/thehousethatlovebuilt to read it for yourself.